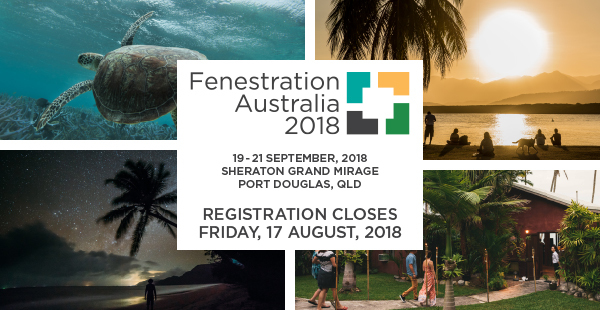 “Join us in tropical far north Queensland this September for Fenestration Australia 2018. The Sheraton Grand Mirage Port Douglas will host three days of trade exhibition and two days of conference sessions for 300 delegates from across the fenestration industry. To open the conference, some old favourites return – the Golf Tournament and Fishing Trip. The Mirage Country Club, bordered by the Coral Sea and a panoramic mountain backdrop (your only distraction! ), is a golfer's paradise. Challenge yourself to 18 holes of Ambrose golf to get you ready for a great conference. The 60 foot MV Norseman features a fully air-conditioned saloon and bridge, a licensed bar, an entertainment centre, upstairs sun lounges and an expansive rear deck with sportfishing platform - plenty of room for you to fish in comfort. Norseman Reef Fishing will ensure you spend more time fishing by taking you quickly and comfortably to the best fishing playgrounds that Port Douglas and the far north has to offer. The sport fishing platform comes into its own when big fish bite! Allow us to warmly welcome you to the conference at the Welcome Party held in the Trade Exhibition. An ideal place to talk to peers and network with fellow delegates in a pleasant, informal setting. Our dinner events aim to bring you dining experiences as colourful as the enchanting surroundings. On Thursday, 20 September, join us in a secret location to unwind and mingle with some of nature's furry and not-so-furry friends: drape a python over your shoulder, cuddle a koala or snap a 'smile with a crocodile'. A buffet dinner will be followed by dancing and unique Queensland entertainment. The 2018 Design Awards on Friday, 21 September, celebrate the talents and innovative achievements of the fenestration industry and provide recognition of members that excel in their field in this professional showcase. This is followed by the Gala Dinner, bringing a formal close to the conference. Copyright 2010 © Australian Fenestration Rating Council. All rights reserved.